Drupal is a popular content management system. A special module is available for integrating Drupal with your forum. IMPORTANT: Please do not download and install this module unless you have a fully working FUDforum installation. Allow forum users to login to your Drupal site with their forum userids and passwords. If the user changes his/her forum profile, it will be synced back to the Drupal site next time he/she logs in. Display a list of the 10 latest forum messages. Display a list of all on-line forum users. Display forum statistics including: number of users, threads, messages, newest member, etc. This module assumes that FUDforum was configured to use PATH_INFO style URLs. See setting in FUDForum's Admin Control Panel. If not, you will have to change the URL format in the module code yourself. 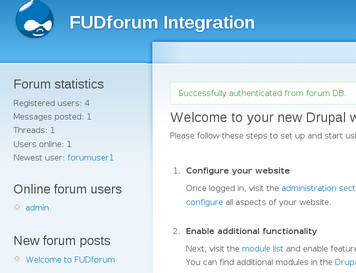 Navigate to Administer » modules and enable the fudforum module. Navigate to Administer » settings » fudforum and enter the path to FUDforum's GLOBALS.php file. Ensure that Drupal will be able to read this file. Remember to change the input format to PHP code. This page was last modified on 19 June 2016, at 20:06.